The doctors are overworked. Equipment is broken. Supplies are running out. Not what you want to see when you walk into a hospital for treatment, is it? But this is exactly what many sick and suffering people in developing countries encounter on a daily basis. No matter how primitive, these hospitals are often their only hope. World Medical Mission, a ministry of Samaritan’s Purse, is working to improve such conditions and offer these patients a far greater hope—the eternal healing of the Great Physician, Jesus Christ. We provide evangelical mission hospitals and clinics with the resources they need—equipment, supplies, and Christian physicians and biomedical technicians to treat their patients while standing as a shining witness of God’s love through Jesus Christ. Wherever we serve, the Gospel is faithfully presented through hospital chaplains, Christian literature, films, audio tapes, and other means. World Medical Mission was founded in 1977 when two surgeon brothers, Drs. 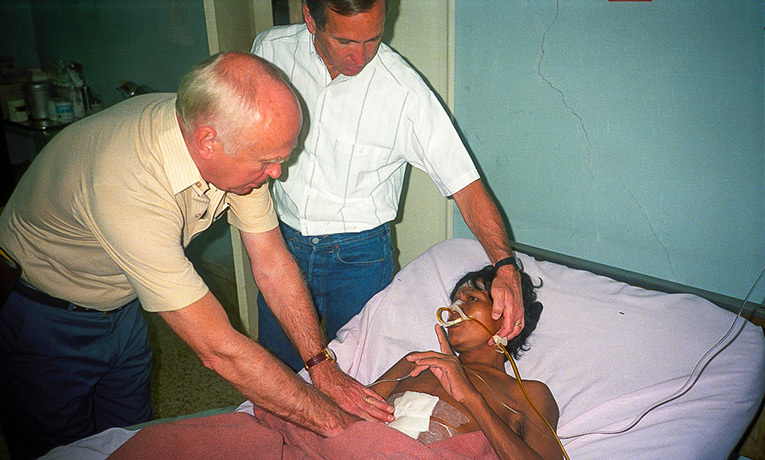 Lowell and Richard Furman, approached Franklin Graham and expressed their desire to volunteer for a short-term assignment in a mission hospital during their vacation. Not wanting to duplicate efforts, Franklin researched the field for other organizations that might already be involved in this work. To his surprise, there were none. While still a student in college, Franklin accepted the challenge to lead this organization, and World Medical Mission was born. Today, we assist scores of mission hospitals and clinics in Africa, Asia, Latin America, Europe, Oceania, and the Middle East by arranging assignments for doctors, dentists, and other medical professionals. We also provide critically-needed equipment and supplies to hospitals and clinics, and send staff technicians to make on-site repairs and installations. The motivation behind all our efforts is to go and “heal the sick who are there and tell them, ‘The kingdom of God is near you‘” (Luke 10:9, NIV). In remote areas around the world, missionary medicine is one of the most effective means of evangelism available. Each year the hospitals we serve are used by God to lead thousands of people to faith in Jesus Christ.